We get about 10 days here in foggy Nova Scotia, that are perfect summer days. Not too hot or too cold, not a cloud in the sky, slight breeze and no plans! In honour of the day we decided to set up Liam's slip'n'slide that he had last summer. Worked fine except the pillow that is supposed to stop you from skidding across the grass at the end was full of holes. Too many holes to repair even if I could have found that mysterious piece of patching stuff that comes with inflatable toys. I mean, really? Who keeps those? And if you keep them, can you find them when you need them? Happy summer, even if it's still a month away! I've been "in reunion" for about 8 years now with Iris. I've only spent face to face time with her on 3-4 different occasions as we live quite far apart. However she does live in the same city that I grew up in and that my adoptive parents still live in. My mom has been very well restrained so far in not showing up on Iris's doorstep with a basket of muffins just to say hi! She did make a point of finding out where she lived and any info she could about Iris when I first got info from the SW on who my first mother was. Well, in less then a month I will be travelling home for vacation. My mom has reminded me a couple of times about how she would love to meet Iris, and maybe we can do lunch, meet in the park so that my son Liam can play while we all sit around and chat. I *think* I'm okay with this, but I'm not sure that Iris will be. Iris has NEVER told ANYONE about my existence. So, any suggestions on how to take a 38 year old closed adoption and make it open? I get to celebrate having 2 mothers today! 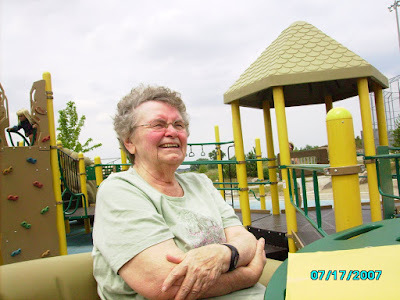 I took this candid picture of Iris 2 years ago on one of our visits together. I'm not sure when this picture was taken, but I really like it. So let the Disco time get started! 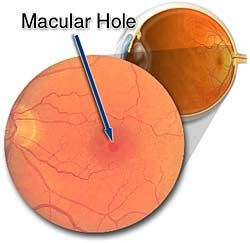 A macular hole describes a central defect in the retina. The macula is the central region of the retina, and is responsible for critical vision including reading, driving, and watching television. A hole develops as the vitreous gel ages. This gel which fills the eye has the consistency of jello. The vitreous gel goes through changes with age which frequently results in floaters. Abnormal adherence of the vitreous to the macular region may result in traction or pulling resulting in a macular hole. There are 4 stages of a macular hole, all of which can result in some degree of symptoms. The most common symptom includes distortion and reduced vision for both near and distance. A macular hole is diagnosed by the ophthalmologist after dilated retinal examination. Optical Coherence Tomography (OCT) helps evaluate macular holes. Refinements in the surgical treatment of macular hole has steadily improved outcome. The procedure involves the removal of the vitreous gel (vitrectomy), placement of a temporary gas bubble in the eye and often removal of a membrane surrounding the hole. Surgery is typically performed in an ambulatory setting under local anesthesia, although general anesthesia can be utilized. The gas bubble is put in the eye so the hole can close under “dry” environment, the fluid in the eye can keep the hole open. In order to keep fluid away from the hole while it closes it is necessary for the patient to remain in a prone (facedown) position anywhere from several days to 2 weeks. It may take up to 6 weeks for the air bubble to completely resolve from the eye. So for up to 2 weeks after the surgery she will have to be either lying one her stomach or walking around with her head bent down looking at her shoes. Luckily my dad can drive and she has lots of friends in town that can help them out if need be. Liam and I are headed there for our vacation on June 24th. I hope the dates of our visit don't overlap her recovery time, as she is really looking forward to spending the week with Liam. It's so hard to watch your parents age, but it's even harder when you live so far away from them. As an only child who's parents are 67 and 73 and starting to have health problems (my mom was also recently diagnosed with Type 1 insulin dependent diabetes), I am suddenly realizing the responsibilities that will befall me in the coming years. Last night I dreamt about the horses. It's been a long time since they have visited my sleep. I wish they had stayed away longer. I stand at the sink and gaze out the window. As always, it is summer. I never remember the winters. There is the tiniest of breezes. Just enough for the faint smell of manure to waft towards me. but I feel glued to the spot. What will I find when I open the door? I never remember the walk to the door. Now I am inside the barn. but I can't wake up. Do I want to wake up? Will this dream be different? or will the horror of the other dreams return? It is the same as all the other dreams. Just the stale stench of old death. In the morning I awake. The feelings and smells stay with me all day. Slowly it fades, but flits back again when I don't expect it. Why does this dream keep returning? This is a recuring dream that I have once or twice a year. I did indeed have horses at my parents house (where this dream takes place) when I was a teenager. They did not die. When I moved out of my parent's house I sold 1 horse and moved the other 2 to a stable that I ended up working for and living at. However, a 19 year old girl living on her own and supporting herself could not afford to stable 2 horses for long, so I eventually had to sell both of them as well. And the winners are the Heathers! This Heather squeaked her answer in just before this Heather. It is a travel pair of chopsticks. You can unscrew each one to make them small enough to fit in the handy-dandy travel container. Thanks for playing. I'm off to search the house for more obscure items.